Have you seen many of those three-sided propeller gadgets that everyone seems to be spinning in their hands these days? Do you own several yourself? Fidget spinners have become extremely popular with kids, leading them to be known as either a silly fad, a useful trend, or a distraction worth banning from school, depending on who you ask. They're also touted as extremely beneficial, with makers claiming gains such as increased concentration for those with ADHD and autism spectrum issues, and relief from stress, anxiety, and even post-traumatic stress disorder symptoms. But are these claims based on solid research, or are they mere marketing hype? Here is what the science may and may not demonstrate about fidget spinners. Distraction from rumination: One potential route for fidget spinners to be stress relievers is through their capacity to distract us from rumination about things we find stressful. While studies haven't examined whether fidget spinners are good distractors, there is research that's looked at the effects of distraction on rumination. One study published in the Journal of Abnormal Child Psychology divided tweens and teens into three groups to see the effects of distraction, meditation, and problem-solving on rumination. It's not surprising that meditation had a positive effect in ameliorating rumination, but the distraction intervention also helped participants shrug off rumination, unlike the problem-solving activity. While the distraction in the study wasn't a fidget spinner but a listening-and-rating activity, the fact that distraction could help people steer themselves away from meditation in ways comparable to meditation is notable. Meditative effects may be in store: Mindfulness and meditation have been shown to have significant positive effects on stress, both everyday stress and more serious forms of stress disorders like PTSD. Fidget spinners have the capacity to be good objects of focus for mindfulness meditations, and if they encourage meditation in those who would not normally engage in meditation, this can possibly be considered a benefit of the spinner itself. Movement and ADHD: Some research has found that young people who experience ADHD often benefit from movement and feel more focused after being allowed to move their large muscle groups. This isn't necessarily demonstrated to be the case with fidget spinners, though the argument can be made that any movement can serve a similar function. There is also the possibility that the benefits gained from large muscle movement are from the physical exercise involved, as there are many demonstrated benefits to exercise. Mini-rituals can help: Those who are on the spectrum may experience stress relief from "mini-rituals," or repetitive behaviors that provide continuity and a comforting distraction. Using a fidget spinner, like a mini-meditation or other rituals, can provide this type of outlet. 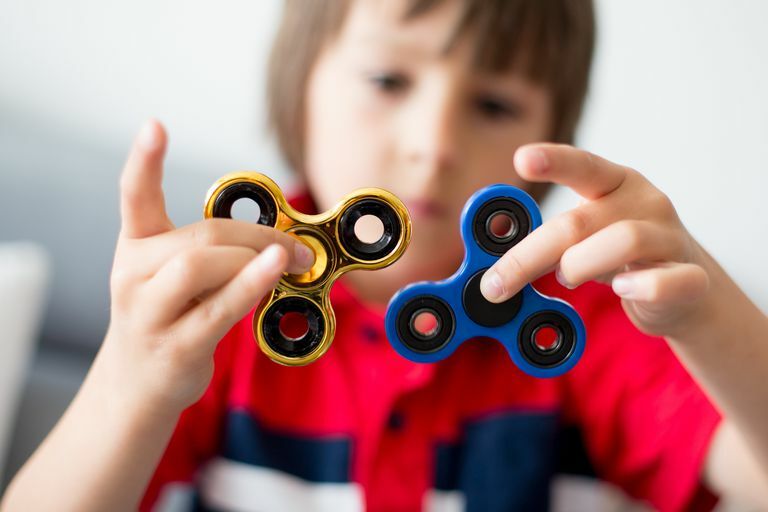 Normalizing a need to fidget: One anecdotal benefit of fidget spinners is that it normalizes some behaviors that many kids, particularly those on the autism spectrum, find to be difficult to stop but also not shared by other kids in the environment. With fidget spinners, a need to fidget stops being seen as something that sets these children apart and makes them feel "different," and more something that everyone is doing, a trend that they are in on, which provides social comfort for many who are just trying to fit in with their peers. Doodling: Studies have found that releasing your creative side in the form of doodles can be a helpful stress reliever. Anything from drawing in the margins of a notepad to enjoying a coloring book for adults to creating actual pieces of art can be great for stress relief. But doodling is probably the closest art-based activity to fidget-spinning and is simple to do. Mini-meditation: Mini-meditations, or meditations that last only a few minutes, can be a stressed and busy person's favorite technique. You can try them in several different ways. You can simply count your breaths as they move in and out of your lungs. You can notice, label, and release your thoughts for the next few minutes as they pop into your head. You can even use apps on your phone or your smartwatch to help yourself with mini-meditations throughout the day. Knitting or crocheting: Many people find that knitting, crocheting and other similar crafts like needlepoint can be wonderful stress relievers. They use the same repetitive-motion hand movements and leave people with beautiful results that allow them to express their creativity. They also provide beautiful gifts for others and make less noise than fidget spinners, though the average tween boy would probably be more comfortable with a fidget spinner in any case. Still, though, for many people, these hobbies are some of the best stress relievers. Whatever you decide on fidget spinners and other hand-focused stress relievers, simply focusing on stress relief can help you to create habits that can minimize chronic stress. And ultimately, many things can be beneficial if they personally bring you stress relief. They may not replace the need for therapy if you are suffering from an anxiety disorder or PTSD, but every bit of stress relief helps! Hill LM and Pollack SD (2012). Getting Out of Rumination: Comparison of Three Brief Interventions in a Sample of Youth. Journal of Abnormal Child Psychology. 2012 Oct; 40(7): 1157–1165. doi: 10.1007/s10802-012-9638-3. Khusid MA, Vythilingam M. The Emerging Role of Mindfulness Meditation as Effective Self-Management Strategy, Part 1: Clinical Implications for Depression, Post-Traumatic Stress Disorder, and Anxiety. Mil Med. 2016 Sep;181(9):961-8. doi: 10.7205/MILMED-D-14-00677. Which Aromatherapy Scents Are Best for Relieving Stress? Can Biofeedback Help Relieve Stress? Is Dark Chocolate an Effective Stress Reliever?